I feel like I’m holding tryouts for Thanksgiving dessert. I love planning the Thanksgiving menu every year, and there are always about fifty desserts I want to make. And, that means that every year several things I really want to bake get lost in the shuffle. So I thought, why not try a few things in advance to increase the number of autumnal desserts I get to taste this year? The only problem will be if everything turns out as good as this dessert, I’ll still have a hard time picking one, or two, for the big day. This cake is from Ina Garten, and it appears both in Barefoot Contessa Back to Basics and on the Food Network site. I learned awhile ago that roulades are much easier than they look, and they tend to store really well. This tender, sponge cake has pumpkin puree and spices, and the filling is made with mascarpone and crystallized ginger. It’s everything you could want in a dessert for fall, and you can make it the day before you plant to serve it. The thin cake is made in a big sheet pan lined with parchment that is buttered and floured. Flour, baking powder, baking soda, cinnamon, ginger, nutmeg, and salt were sifted together. Eggs and granulated sugar were mixed in a stand mixer, and pumpkin puree was added. You can use canned pumpkin puree or homemade. I had just brought home a cute, pie pumpkin which I roasted and used for a few different recipes. 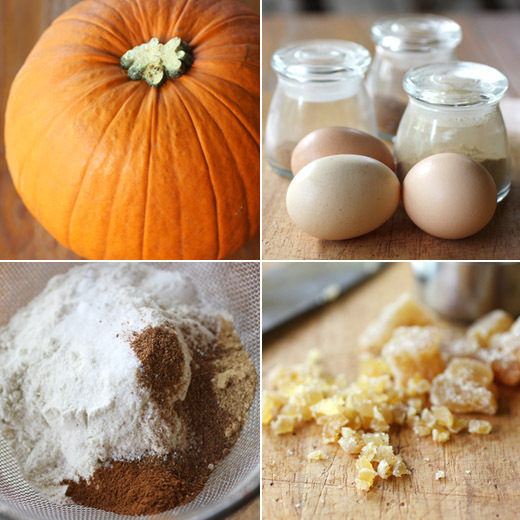 After the pumpkin is mixed into the eggs, the flour mixture was slowly added until just incorporated. A spatula was used to finish folding the flour into the batter. It’s always a good idea to fold a batter with a spatula few times after taking the bowl off the mixer to be sure there are no unmixed, dry ingredients at the bottom of the bowl. The cake was baked for a mere ten minutes, and then it was turned out onto a towel dusted with confectioner’s sugar. It’s a scary moment to just plop the hot cake right out of the pan, but don’t even worry. With the parchment, it comes right out. The parchment was peeled off, and the warm cake was rolled with the towel rolled into it, into a spiral starting at a short end. If the edges look uneven, they can be trimmed later. Rolled into the towel, the cake was left to cool completely on a rack. The filling was made with mascarpone, confectioners’ sugar, and heavy cream. Once those ingredients were well-mixed, finely chopped crystallized ginger was added. To finish the cake, it was unrolled, the filling was spread over the top, and then it was rolled back into a spiral without the towel this time of course. The edges were trimmed, it was placed on a platter, and it was dusted with more confectioners’ sugar. 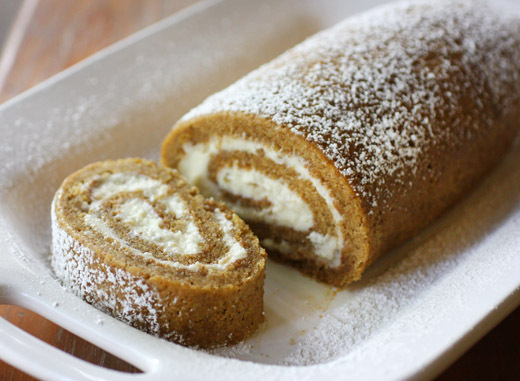 This pumpkin roulade will be a serious contender for a spot on the menu this year. I have a few more weeks to keep testing desserts which is starting to seem like not enough time. There are so many great things to make with pumpkin, and then there are cranberries to consider. Do you try new desserts every year for Thanksgiving, or do you have favorites that are expected on the menu? Beautiful! I really love that buttercream. Just perfect! I love pumpkin rolls!!! The pairing of ginger with pumpkin is one of my favorite sensory delights each autumn. What a sweet change from pumpkin pie! Of course the creamy mascarpone filling got my attention! I would love to prepare something other than pies for Thanksgiving! Apple, pumpkin and pecan are always in demand. After 3 days with no power, water or cell service thanks to sandy, I could probably eat this whole thing right now. Looks delicious!!! This roulade would be so welcome at our Thanksgiving. I concentrate on the savory items, let others bring the desserts, but maybe this year, if I could squeeze in a dessert, this just might be the one. Super delicious with the ginger buttercream! I'm going to start auditioning recipes imminently...thankfully I have a boyfriend to eat most of the more decadent ones up for me. Pretty sure I wouldn't be able to share this roulade though. The ginger buttercream filling is calling to me. That looks beautiful, Lisa! And it screams fall. Absolutely wonderful - I wish I could make roulades so perfectly! The roll looks moist and delectable! Love ginger buttercream! We're always boring with Thanksgiving dessert - pumpkin pie is our tradition, so pumpkin pie is what we always have. But the idea of trying out some other desserts is wonderful - we get the pleasure of eating them in advance of Thanksgiving, and still can have our pie on the day itself! 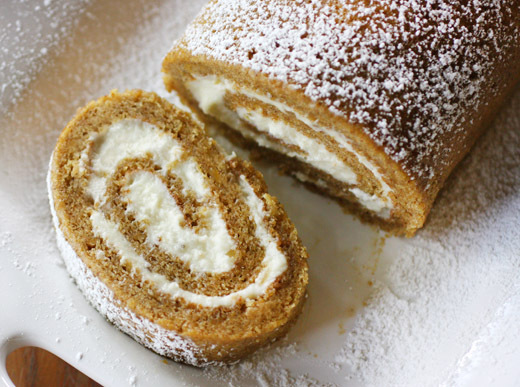 This pumpkin roulade looks great, and I'll bet the ginger buttercream was wonderful. Such a nice flavor combo. Good stuff - thanks. what a perfect roulade! frankly, i'm pleased when i can get it to roll at all, much less crack-free and perfectly symmetrical. bravo! I'm not normally one who would like pumpkin in something sweet (at least I can avoid pumpkin pie in the UK!) but this recipe does intrigue. Love a nice roulade, and they are always easier than their fancy look would indicate (if you don't mind a few cracks, in my case). I'm sure this would be a welcome change on the upcoming Thanksgiving feast table. This is one of those "good grief good" looking cakes. I've never tried a rolled cake, but have it on my cooking bucket list. Pinned. I've always wanted to make one of these but never had the guts to do it! I'm always so impressed with my fellow bloggers who can bake such lovely desserts. I'm not a baker. I can make the usual cookies and muffins, but when it comes to anything fancier, I'm not the best. this post is so timely for me, as i'm just figuring out what i want to have for thanksgiving dessert - i think i'll do a mix of the classic pumpkin pie and then throw in a few new things - this looks and sounds so delicious, maybe i'll have to get over my fear and try making it! I love Thanksgiving meal tryouts! Haha! My mom makes what we call a pumpkin roll, but I've never tried it before. I think I'd love the added flavor of the ginger in your buttercream. This is gorgeous!